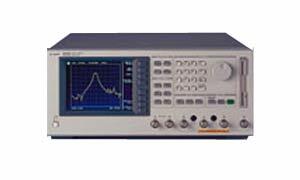 The Agilent E5100A network analyzer is a 10 kHz to 300 MHz network analyzer best fitted for production lines of electronic component manufacturers, especially resonator and filter manufacturers, who require extra-high throughput. The Agilent E5100A improves production line productivity with its fast measurement speed (fastest sweep speed is 0.04 ms/point), fast waveform analysis commands, and high speed processor. It provides faster measurements with lower fluctuations because of its low-noise performance and fine selection IFBW. Discontinuance Notice: Some options and upgrade kit for Agilent E5100A network analyzers were discontinued as of May 1, 2006.